What is a Health City? Health City is an IT service platform comprising a kit of interoperable applications and IT systems. 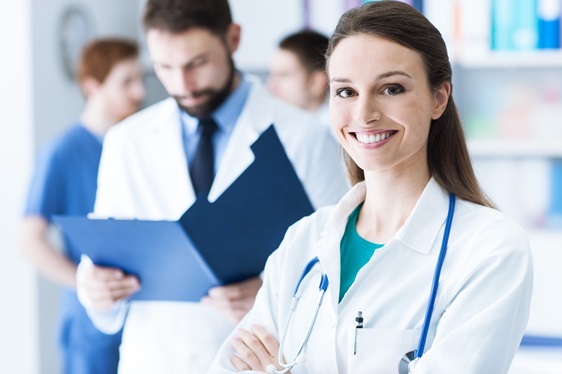 Health City creates and provides a set of tools for medical staff, patients and healthcare system administrators to guarantee comprehensive healthcare throughout life from birth. The main assumption of the project is to provide residents with life-long comprehensive healthcare from birth, while simultaneously shaping medical services available in the city. 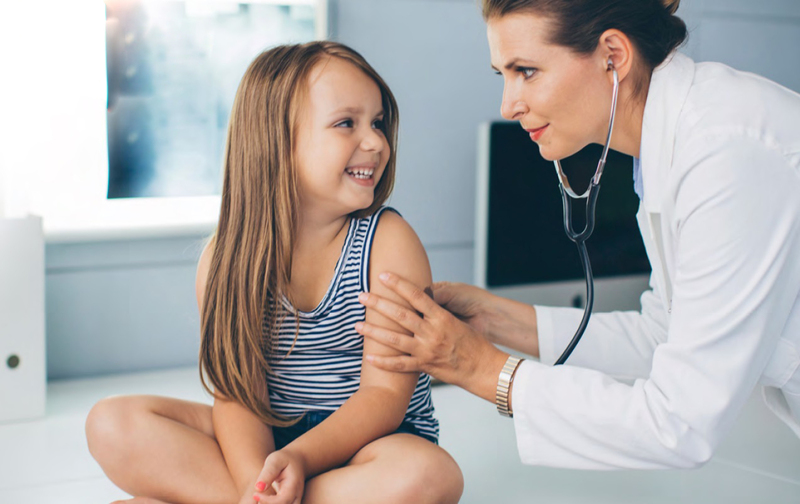 Using a Portable Telemedicine Unit, mobile diagnostics of primary school students is performed to schedule and conduct appropriate screening tests. Makes it possible to offer home care to patients following cardiological diseases, and within the cardiological risk group; it permits ECG monitoring within the hospital, and supports the post-hospitalization rehabilitation process. The application of the remote CTG solution makes it possible to offer care to pregnant women at home with simultaneous automatic data transmission in respect of test data and results. Medical-hub software and hardware make it possible to provide telemedicine services with continuous patient monitoring outside the hospital and, in the event of a fall or risk to life, to call an ambulance. Complementing traditional healthcare to allow teleconsultations, access to medical data, automatic reminders about the need to administer medication, and provides for monitoring of whether patients follow doctors’ recommendations. Makes it possible to keep and electronically share patient medical records, with intuitive searching at the browser level and an assurance of continuous and selective access to patients medical documentation only by authorized persons. 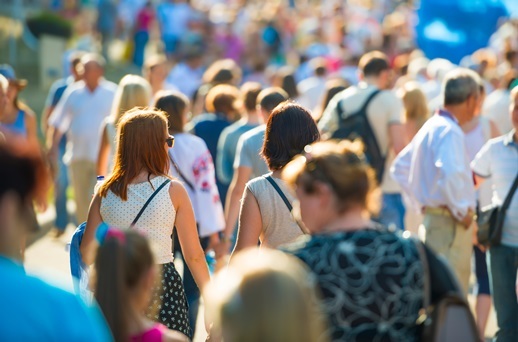 This solution is a set of tools for population health data analysis. The data collected and analyzed provide information to sched¬ule health care and prevention measures. 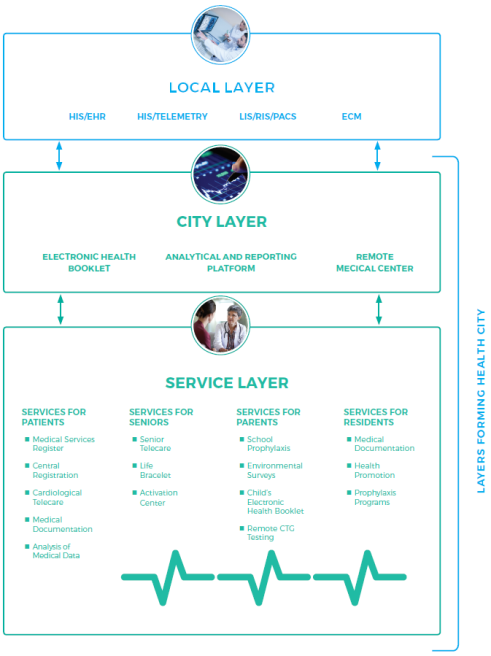 Discover layers forming the Health City Platform. Comarch e-Care telemedicine platform functions within Health City. The solution gathers qualified medical staff to allow patient monitoring using the services in the 24/7 mode. 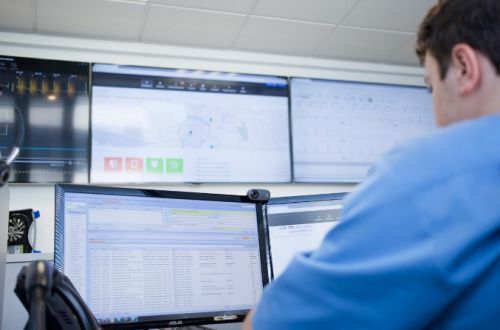 24/7 care allows swift intervention in the event of automatically detected anomalies. The Telecommunications Platform integrates medical data and devices. It also includes IT systems such as: Electronic Health Booklet and Analytical and Reporting Platform. 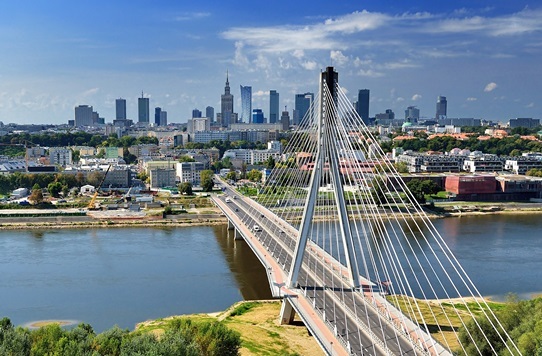 Learn more about the projects conducted in several cities in Poland. Under the contract concluded by Comarch S.A. with the National Center for Research and Development (NCBR), development works are performed, and a demonstration installation of the Health City telecommunications platform is created. Comarch’s investment in the project totals PLN 20 963 504.00, of which PLN 8 385 401.60 will be co-financed by the NCBR. Contract implementation began in January 2016, and will continue until December 2018. The project is carried out under Measure 1.1: R&D projects of the Smart Growth Operational Program 2014 – 2020, co-financed from the European Regional Development Fund.